Social media is an interesting case, as its dominance this year isn’t seen by any particular “leap” or “bound” (though we could cite Facebook’s staggering 1.55 billion monthly active users). Instead, it’s the subtle ways in which seemingly everything we do has become social that warrants the industry’s inclusion on this list. Gone are the days when Facebook accounts were seen as a toy of the student, or as another fad to be weathered. Consider the current U.S. presidential election, for instance. Every debate thus far has tapped into social media for questions, expanded discussion, and sentiment analysis. For better or worse, the question of whether or not a policy can “trend” in today’s climate can have a big impact on the amount of attention it receives from a candidate—thus changing the political landscape of our country as a whole. Social movements, too, have gathered momentum. The collective power of a hashtag has seen CEOs outed from their roles, and has raised hundreds of thousands of dollars to help those struggling with various issues, large and small. Inarguably, the power of today’s “network” has never been higher, and organizations of all sizes must carefully monitor accounts to prevent any perception of scandal. It was an interesting year for wearables, with Fitbit’s IPO serving as one of the year’s most lucrative openings. And, with big names like Apple and Samsung expanding their product line to better fill demand, sales reached a previously unseen peak in 2015. Wearables haven’t had a perfectly smooth ride, however. Many analysts were surprised by lower-than-expected volumes for the Apple Watch, while others took losses on lost momentum following Fitbit’s explosive start. We read this not as a lack of interest in the future of wearables, but rather as an indicator that people want their devices to move past rudimentary activity tracking and into more robust applications. In the year ahead, we’ll be interested to see how the scope of these devices evolves to serve a wider set of interests. This space evolved quickly over the past year, with the promise of genomics serving as a catalyst for a vast range of startups. The change? 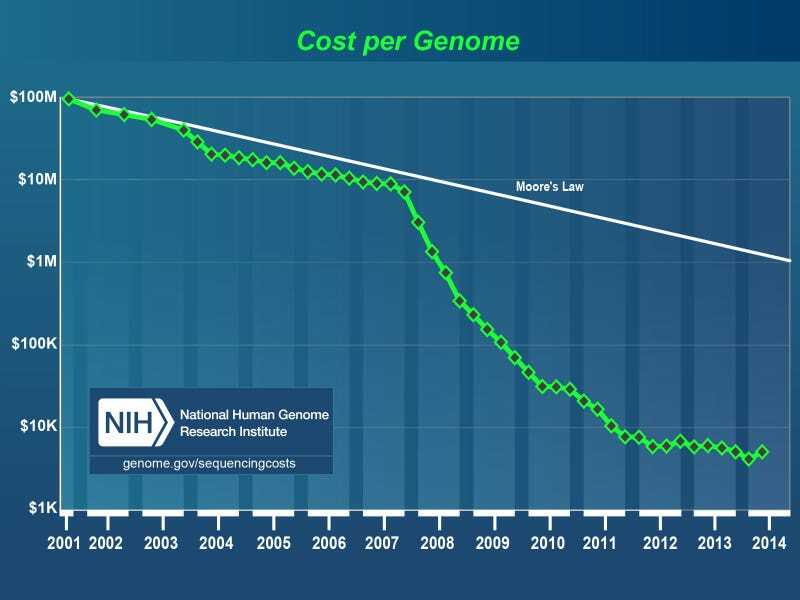 Well, the cost of sequencing the human genome (i.e. the full range of DNA in any individual person) was as high as $100 million just 15 years ago; today, there are options in the $1,000 range. With these obstructive costs gone, the field is really starting to take off. But, why does anyone care about their DNA? The promise and potential of this field lies in its ability to better predict and eliminate disease. By applying machine learning to massive pools of genomes—and charting the medical history of individuals within those pools—we can better understand which portions of our body’s “code” contribute to various diseases (and subsequently take action). As this field is still in relative infancy, we’re excited to see how applications grow in the year ahead. Interested in our predictions for top movers in 2016? Find them here!